"The world . . . is not a nice place, and the innocent and the young have to take their chances." William Maxwell, Time Will Darken It (1948), p. 74. The Illinois Odd Fellows' Children's Home greatly improved the chances for less-fortunate children to overcome loss of family and to develop the qualities needed for personal and vocational success as adults. 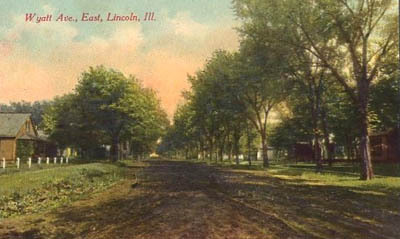 For a full century, from 1893 to 2003, this institution significantly contributed to this most humanitarian cause and to the development and distinct character of Lincoln, Illinois. To help clarify the nature and purpose of the Odd Fellows' organization, I quote from the home page of its Web site (address below in Sources Cited). "In 17th century England, it was odd to find people organized for the purpose of giving aid to those in need and of pursuing projects for the benefit of all mankind. Those who belonged to such an organization were called "Odd Fellows." Odd Fellows are also known as "The Three Link Fraternity," which stands for Friendship, Love and Truth. Odd Fellowship became the 1st national fraternity to include both men and women when it adopted the beautiful Rebekah Degree on September 20, 1851. This degree is based on the teachings found in the Holy Bible and was written by the Honorable Schuyler Colfax, who was Vice President of the United States during the period 1868-1873. Odd Fellows and Rebekahs were also the first fraternal organization to establish homes for our senior members and for orphaned children." This symbol in concrete also appears high on the front of the IOOF Building in Lincoln, Illinois, at 112 South McLean Street near the Edward R. Madigan Post Office Building. 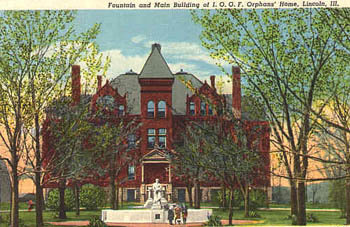 This IOOF Building "was dedicated in 1916. Over the years, several different businesses were located on the first floor, including Langellier Motor Company  and the Courier [just before it relocated to its present site in 1939]. Lodge rooms were on the third floor and consisted of a lodge hall, kitchen, and dining room. The building was sold. . . in 1977" (Gehlbach, back cover of Our Times, vol. 6, no. 2, winter, 2001). Cheer up with a little song." From poem titled "Do Something" (anonymous) in 1913 IOOF brochure describing the purpose of the IOOF, its Orphans' Home in Lincoln, and its Old Folks' Home in Mattoon, Illinois. 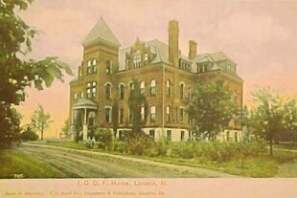 · September, 1889: The Daughters of Rebekah, the auxiliary of the IOOF, obtained a charter from the State of Illinois to establish an orphans' home ("Homeless Children and Orphans Find Haven at Lincoln Odd Fellows' Home," Lincoln Evening Courier, centennial edition, section three, August 26, 1953, p. 2). · November, 1889: At the state IOOF convention, Philanthropist George W. Chowning of Lincoln's Odd Fellows' Lodge 204 and the City of Lincoln pledged 40 acres and $10,000 for the home to be built in Lincoln (Shelbyville was also being considered) ("Homeless Children and Orphans Find Haven at Lincoln Odd Fellows' Home," p. 2). In addition to the preceding grants, "Lincoln also contributed another $4,000 toward the purchase of land, while $8,000 was donated by R.B. Latham, P.P. Andrews, [D.H.] Harts [Sr.], and [Frank] Frorer, and S.A. Foley (Gleason, Lincoln: A Pictorial History, p. 185). With these funding sources "and the touching remarks of Mr. Chowning together with the central location and railroad facilities, Lincoln was chosen as the site for the home" (Courier, August, 26, 1953, p. 2). · 1892--1928: Eight more buildings added (Courier, 8-26-53, section 3, p. 2). Gym constructed in 1925 (Gehlbach, "Home, Sweet Home," p. 2). 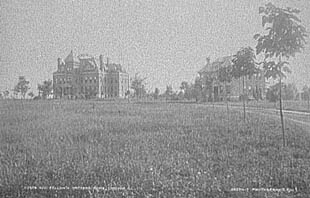 "In front of the buildings was an enormous lawn with shade trees, huge flowerbeds, a circle fountain, and a wide brick walk that the boys kept weed-free by crawling on their stomachs and gouging out every weed or blade of grass with a rusty spike nail" (Gehlbach, p. 2). A 1913 IOOF brochure estimated the value of the buildings at $200,000. 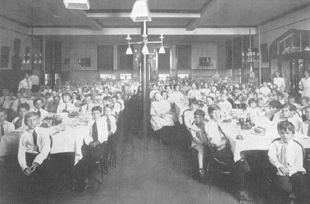 · 1923: Former residents create the Sons and Daughters of the Illinois Odd Fellows' Children's Home and annually reunite during a homecoming on Labor Day weekend. This organization has contributed equipment and thousands of dollars to constructing and furnishing the Home and to other IOOF causes and facilities (Beaver, p. 80). · 1944: Home opens to children of non-members of the IOOF "whose families, orders, or the courts pay $25 a month" (Gehlbach, p. 3). · 1947: Name officially changed from Odd Fellows' Orphans' Home to Odd Fellows' Children's Home to reflect the informal change long in common usage (Gehlbach, p. 3). · 1967: "A ranch-style home accommodating 48 children is dedicated. Razing of older buildings continues" (Gehlbach, p. 3). · 1993: "The Home surrenders its license for residential care to the Illinois Department of Children and Family Services. Since 1893, 1,670 children have lived there" (Gehlbach, p. 3). · 2000: The day care center closes on June 30th. Only the gymnasium, the superintendent's cottage, and two garages remain. 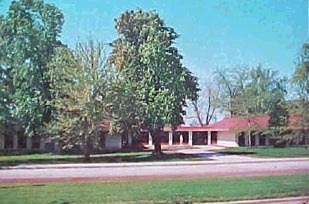 Central Illinois Economic Development Corporation runs a day care center in the main building; the YMCA rents the gym" in 2001 (Gehlbach, p. 3). Nancy Gehlbach's "Home, Sweet Home" (Our Times volume 6, issue 4, winter, 2001) presents a complete history of the Illinois IOOF Children's Home in Lincoln. She describes a well-run operation with conscientious administrators, teachers, and other employees. Mrs. Gehlbach's work in this issue presents a full portrait of life in the Home, based on interviews with former residents and employees. She divides her history according to the times of the administrators, following the first superintendent, Mrs. Lizzie L. Morrison. The subsequent periods and administrators are as follows: 1906-1926, Dr. and Mrs. J.A. Lucas; 1926-1940, Superintendent Roy Johnson and his wife, Matron Icie Johnson; 1967--1994, Robert and Darlene Wick. Two themes emerge from Nancy Gehlbach's history: (1) the children who lived in the Home were well cared for, educated in and out of the classroom and on field trips, taught discipline and responsibility, and given various opportunities for recreation; and (2) many townspeople contributed as employees, volunteers, or otherwise expressed friendship toward the children. Helpful townspeople included the legendary Band Director H.O. Merry (p. 5) and such other teachers as John and Paul Beaver and Bobbie Connolley (p. 9). No summary of Nancy Gehlbach's history can convey her interesting and informative material, including the many anecdotes. Here, I offer just one such anecdote: "One night Bob Johnson and Russell Krager snuck out to Lincoln Lakes and took a lifeboat out. They were found by the night watchman, who had a bright flashlight and, says Bob, 'the biggest dog I ever saw in my life.' The watchman let the boys stay all night and took them back on the steam engine in the morning. When he asked Bob his name, he said, "Bob," "Bob White'" (p. 6). That night watchman and his best friend were less friendly to trespassing town guys when he caught them camping on "the Island." In 1913, the Home consisted of seven buildings that provided for administration, worship, education, and living quarters (IOOF brochure of 1913). "The Home covers 158 acres of land, 120 acres of which is farmed to produce grain to feed cattle, hogs, and chickens, for Home use and market" (Courier, 8-26-53). According to Gehlbach's "Home, Sweet Home," The boys ate their meals in the dining hall in the domestic science building with all the other children. When they heard the a ringing of the cowbell outside the door, they went inside, cleaned up, stood by for inspection hands, and then lined up to go into the dining room and find their assigned tables. After the children sang grace, a little bell was tapped, and everyone sat down. There were 18 tables, usually eight to a table and each one with an older boy or girl in charge. There was a birthday table, too. Unlike earlier years, children could talk to others at their table, but not from one table to another. . . ." "The children ate lots of navy beans, corn bread, porridge, peanut butter, stew, chicken and eggs from the Home's farm -- run first by Raymond Dobbs and later by Ed Wilmert -- and a mixture of ground beef and vegetables called slum gullion. A favorite breakfast was cocoa and toast. "There was plenty of fresh produce from the garden -- presided over by a dignified Englishman named John Wakenshaw -- and plenty of milk from the farm's Holstein cows. There were raspberries, too, picked by the children themselves" (Gehlbach, p. 4). 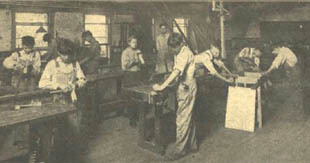 "We maintain a modern manual training school for our boys and a domestic science school for our girls, in addition to the eight grades of the common school. 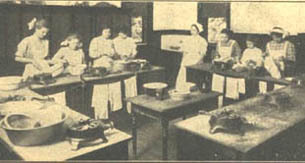 While many of the children in our Home have come from parents who have suffered and died from tuberculosis and are therefore in a low state of physical development, our system of life at the Home, with its wholesome and nourishing food, its fresh air and pleasant surroundings, has made a wonderful record for turning out physically and mentally perfect young men and women" (1913 IOOF brochure). Extracurricular activities included basketball in the gym, baseball, and music, including the Home's band. 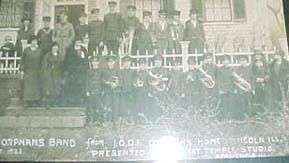 "Home, Sweet Home" contains a photo of the band in front of the Home's bus in 1936. The caption notes that during the Johnson years the band consisted only of males. The above photos, however, show that females were in the band in 1913 and 1923. "Professor H.O. Merry was the director of the band, in a day when kids' bands were still something of a novelty. 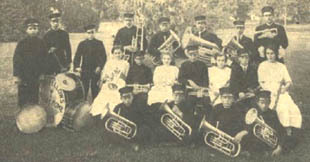 The band played at lodges across the state, often heading up parades in the little towns they visited. They played at the Old Folks' Home in Mattoon and went with the home kids on the interurban to the Odd Fellows picnic in Bloomington. "Professor Merry was also the high school band director, and many of the Home kids played in that band" (Gehlbach, p. 5). I was one of the countless hometown kids who benefited from the recreational facilities of the IOOF Children's Home. In pre-teen years, I played in the "Pony League" baseball program. Games were often held on the Home's baseball field. It was well maintained and had dugouts and an outfield fence with advertisements of local businesses. Playing there seemed like being in the majors. Unfortunately my most vivid memory was being struck out by bubblegum-popping neighbor Leonard Newton, whose fast ball froze me in terror. I rationalized that his superior strength resulted from his being a few years older. It was on my 5th birthday (Feb. 3, 1927) that my mother passed away... sometime later, Dad who was an itinerant farm laborer, had to do something with the 7 kids whom he could not care for all by himself... on June 4th, 1927, three of the youngest four were committed to this Orphanage and the next year the youngest one came there, too.... we were all placed in the boys building, aptly called the Main Building, being built first and containing the Superintendent's offices... At that time he was Roy Johnson and wife... this building had 4 floors and a basement. ... it also had a slate roof.. I remember this as I was out on it more than once, although it was strictly against the rules... wasn't meant to be tromped around on, but boys will be boys, I guess. Speaking of the band... we always had a rather good one, to my thinking.. and you can blame that onto the old professor who taught us... he was a friend to us all, but a strict believer in doing ones best in each situation... he never accompanied us on our "band trips" which we did each summer after school was out... I am sure there are a lot of the towns in Illinois where we did not perform, but probably each town we did give concerts in very likely had a Odd Fellows chapter also... not sure of this as at that time, who cared anyway or even gave it a consideration? We were, after all just kids out for a good time... we had uniforms and our own bus and our driver, named William Vehrs, was in charge of us. Oh, before I forget, Mr. Johnson would travel with us the greater part of those times and would give speeches before each concert.. and or course he was the #1 caretaker of us all... After concert time was over,we stayed in peoples homes over night and they fed us before leaving again for the next destination. As of 6-09, Dave is on Facebook. Gleason, Paul E. Lincoln, Illinois: A Pictorial History. St. Louis, MO: G. Bradley Publishing, 1998. Material from Mr. Gleason's books is copyrighted with all rights reserved. Mr. Gleason's material used in this Web site is with permission from the G. Bradley Publishing Company, 461 Des Peres Road, St. Louis, MO 63131. Call 1-800-966-5120 to inquire about purchasing Lincoln, Illinois: A Pictorial History (1998) (200 pages of rare photos and text) or Logan County Pictorial History (2000) (also 200 pages of rare photos and text). Visit www.gbradley.com/. "Homeless Children and Orphans Find Haven at Lincoln Odd Fellows Home." Lincoln Evening Courier, centennial edition, section 3, page 2, August 26, 1953. Maxwell, William. Time Will Darken It. NY: Vintage Books, 1948. William Maxwell's works are available at www.amazon.com and www.barnesandnoble.com. Also please email me if this Web site helps you decide to visit Lincoln, Illinois: dlh105f@smsu.edu.